Creators, Crafters, Tinkers… What Will You Make at the Maker Faire Bay Area? 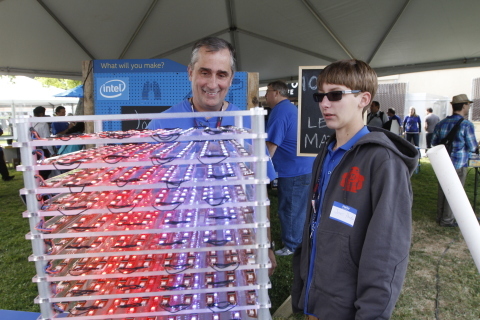 The weekend of May 15, the 10th annual Maker Faire will take place in San Mateo, Calif. Intel will be calling all makers, crafters and tinkers to have fun with our hands-on learning activities, interactive games and demonstrations of inventions made with Intel(R) Edison and Intel(R) Galileo. Come listen to DJ Thud Rumble*, play robot laser tag and enjoy carnival-style games by Two Bit Circus. View the media alert for event detail and watch highlights from the Maker Faire Bay Area 2014. Intel (NASDAQ:INTC) is a world leader in computing innovation. The company designs and builds the essential technologies that serve as the foundation for the world’s computing devices. As a leader in corporate responsibility and sustainability, Intel also manufactures the world’s first commercially available “conflict-free” microprocessors. Additional information about Intel is available at newsroom.intel.com and blogs.intel.com and about Intel’s conflict-free efforts at conflictfree.intel.com. * Intel and the Intel logo are trademarks or registered trademarks of Intel Corporation or its subsidiaries in the United States or other countries.